UniFirst executives ring the NYSE bell. WILMINGTON, Mass., Sept. 27, 2018 /PRNewswire/ -- The No. 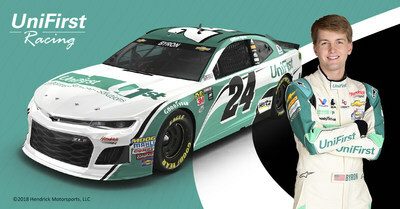 24 UniFirst Chevrolet Camaro ZL1, driven by 20-year-old rookie of the year contender William Byron, returns to the track this Sunday, Sept. 30, for the Bank of America ROVAL 400 in Byron's hometown of Charlotte, North Carolina. The 109-lap race on Charlotte Motor Speedway's new 2.28-mile "roval," which combines a portion of the traditional 1.5-mile oval with sections of the infield road course, begins at 2 p.m. EDT and will be nationally televised on NBC. UniFirst Corporation, a leading provider of customized work uniform programs, corporate attire, and facility service products to businesses throughout North America, continues its partnership for the 2018 NASCAR season with 12-time NASCAR Cup Series champions Hendrick Motorsports. This year marks the second of an eight-year agreement with Hendrick Motorsports that names UniFirst as a primary sponsor of select races and a full-season associate sponsor of the No. 24 team through 2023. UniFirst is the official workwear provider for Hendrick Motorsports and sister company Hendrick Automotive Group, which is the largest privately held retail automotive organization in the United States. "We're excited to see William Byron back in the driver's seat of the UniFirst No. 24 Chevy Camaro," said Adam Soreff, UniFirst's director of marketing and communications. "His thousands of NASCAR fans from around the country, and right here at UniFirst, will be cheering him on to victory in Charlotte and continuing to support him as he drives closer toward capturing the 2018 rookie of the year title." With just eight races remaining in the 2018 season, Byron continues to hold the lead in the battle for NASCAR Cup Series rookie of the year honors after 28 races. He is coming off winning the NASCAR Xfinity Series championship and rookie of the year honors in 2017 – a season that included wins at Iowa, ISM Raceway, and the historic venues of Daytona and Indianapolis, where he became the youngest winner of a major race in the track's 108-year history. "I'm looking forward to running the UniFirst Camaro this weekend at the 'roval,'" Byron said. "It's nice to be at home and I'm happy to have the UniFirst colors on our car. Road courses have been solid for us this year, so hopefully we can lean on our notes some, but this is going to be a completely different beast. It will definitely be exciting for the fans." Founded by Rick Hendrick in 1984, Hendrick Motorsports has earned 250 points-paying race victories and a record 12 car owner championships in the premier NASCAR Cup Series. The organization fields four full-time Chevrolet teams on the Cup circuit with drivers Chase Elliott, William Byron, Jimmie Johnson and Alex Bowman. Headquartered in Concord, North Carolina, Hendrick Motorsports employs more than 600 people. For more information, please visit HendrickMotorsports.com or interact on Twitter, Facebook and Instagram.